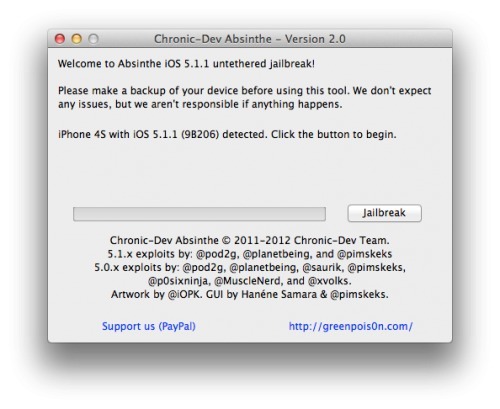 These are instructions on how to perform an untethered jailbreak of your iPhone on iOS 5.1.1 using Absinthe for Mac. Warning***: Before you continue make sure to do a backup of your device in iTunes as you may lose your Camera Roll during this process. Download the latest version of Absinthe from here. Double click to mount the downloaded dmg and drag the Absinthe application to your desktop. 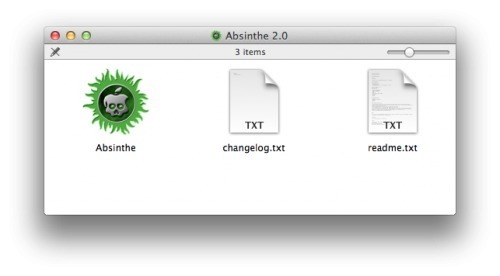 Double click to launch the Absinthe application from your desktop. As prompted, connect your iPhone to the computer via USB. Make sure to remove any passcodes or VPN settings you've previously set. The application will take you through several steps to jailbreak including: beginning jailbreak, sending initial jailbreak data, sending final jailbreak data, waiting for reboot, and waiting for process to complete. You will be informed that the jailbreak is 'Done'. In a few moments you will notice Cydia appear on your Springboard!